Following last week’s announcement of its Ford Co-Pilot360 safety package, Ford revealed on Tuesday that the redesigned 2019 Fusion sedan will debut what it calls the most advanced suite of standard driver-assist technologies. Set for a public debut later this month at the 2018 New York International Auto Show, the 2019 Ford Fusion will also boast a sleeker new look, and its plug-in hybrid Energi variant is expected to be more efficient than the outgoing version. 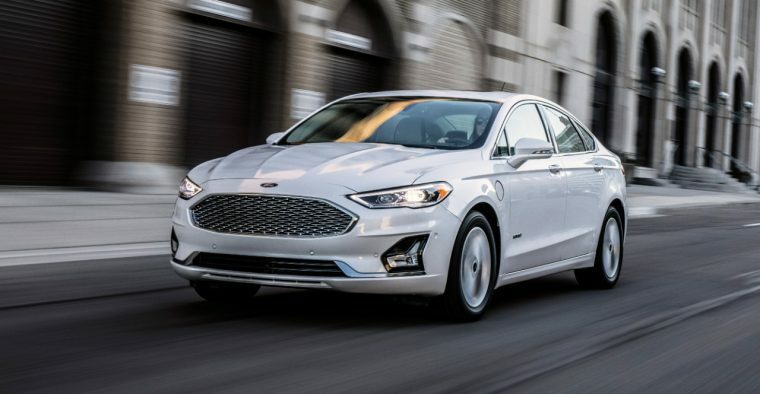 Every trim in the Fusion lineup will be offered with Ford Co-Pilot360, which includes Automatic Emergency Braking with Pedestrian Detection, Blind Spot Information System with Cross Traffic Alert, Lane Keeping System, and Auto High Beams. The Fusion SE will now be offered with the 1.5-liter EcoBoost with Auto Start-Stop, while the 2.5-liter Duratec inline-four remains the base engine. In addition, the Fusion SE and above models will come standard with an 8-inch LCD touchscreen and embedded 4G LTE modem, and SYNC 3 will provide access to Alexa skills with the Ford+Alexa app.